City Administration keeps trying to improve health service for citizens. Moreover, based on Jakarta Health Department record, the number of citizens getting medical treatment in Community Health Center(Puskesmas) in all over Jakarta have increased since National Health Insurance(JKN) applied.
" We will check IFA for productive age ladies, immunizations for infants and for elderly we will continue the program there. 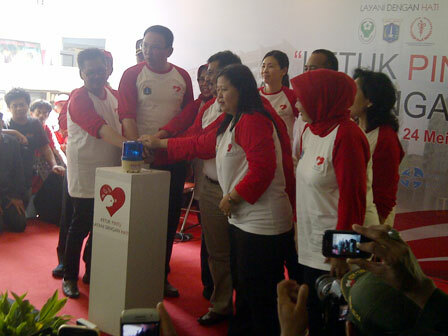 We will give BPJS for Jakartans who still don't have it"
"The patient number increase up to manyfolds," said Head of Jakarta Health Department, Koesmedi Priharto, when launching "Ketuk Pintu Layani Dengan Hati" program in Pinus Elok Flat, Cakung, East Jakarta, Sunday (5/24). The program is powered by PKK DKI team cooperating with some LSM. He claimed since JKN program applied 3 years ago, patients in all health centers in the city become more. "Hence, we create Ketuk Pintu Layani Hati program. We will check IFA for productive age ladies, immunizations for infants and for elderly we will continue the program there. We will give BPJS for Jakartans who still don't have it. We hope it all could be the data," he told. He disclosed, "Ketuk Pintu Layani Hati" program will take place until upcoming October 5 in all over Jakarta areas. "The same event held today in a Low-cost Apartment in Tambora, Johar Baru, Kampung Deret Selatan and Marunda Jakut. Thus, all will be recorded," he disclosed. He added, his party has prepared the other program in order to increase health of Jakartans. The program is including provision of health personnel of doctor, nurse and midwife. "Each 1,250 citizens will be given 1 doctor, 1 nurse, and 1 midwife. It aims to citizens feel like having personal doctor," he disclosed.